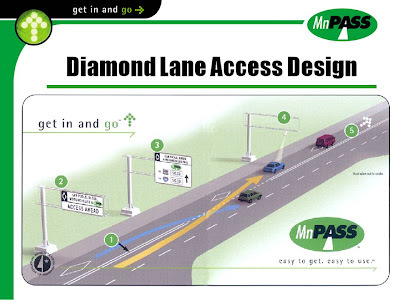 Limited-access, normally barrier-separated highway lanes that provide free or reduced cost access to qualifying HOVs, and also provide access to other paying vehicles not meeting passenger occupancy requirements. By using price and occupancy restrictions to manage the number of vehicles traveling on them, HOT lanes maintain volumes consistent with uncongested levels of service even during peak travel periods. Why did Minnesota switch to HOT lanes? 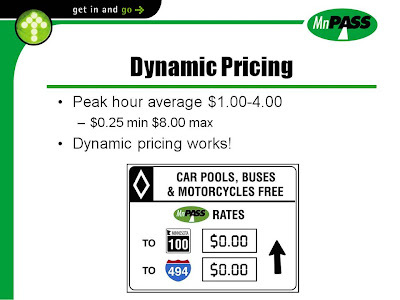 -HOV lanes for carpool/transit are successful, but operating at less than full potential. -During peak, HOV lanes are typically moving more people per lane than general-purpose lanes. HOT lanes allow them to maintain free flow speeds for transit and carpools while improving highway and transit in their corridors and generating revenue. Variable tolling is the key. The more demand there is for the lanes, the more it costs. The following photos show how it works. Click them to make them bigger. Variable tolling is really, combined with Transit improvements, the only sustainable way to shape traffic and reduce peak congestion. HOT lanes allow this to be politically possible in North America. People don’t seem to mine being tolled for new infrastructure. But as the lack of road pricing in Vancouver today shows (there should have been by now), there is no appetite for road pricing on old infrastructure. People don't see the value, right or wrong. Now the Port Mann/ Highway One Project would seem like the perfect place to implement HOT lanes. The project could convert the proposed HOV lanes and the two new general-purpose lanes to HOT lanes. The revenue could be used to build transportation choices in our region. One of the major concerns of the public when Minnesota did HOT lanes was the perception that they were building “Lexus Lanes” or roads for the rich. Their data shows that all demographic are represented in the HOT lanes. Check out this Wikipedia article to see where HOT lanes are or are being planned in the US. The Washington State Department of Transportation also has a great study on their brand new, successful HOT lane project. Fantastic idea all around. A better idea would be to build the transit first and then see if the new Port Mann is even necessary, but that's unlikely to happen. I'm particularly intrigued by the demand activated pricing. That's similar to pricing based solely on day and time of day, but is more flexible and can quickly accommodate changing conditions. I like it a lot. It does reduce predictability somewhat, however. Nobody would know for sure before leaving home/work what they would be paying and, if conditions changed during their commute, the price might even change during the trip.